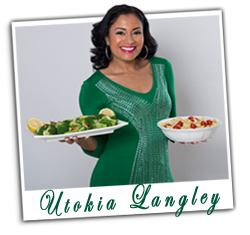 This website is provided to you by Utokia Langley, She’s Got Flavor, ShesGotFlavor.com and Flavor Media, LLC (“we” or “us”). Please take a moment to read Website Visitor and Usage Agreement. By using the She’s Got Flavor website, you accept this Website Visitor and Usage Agreement. The She’s Got Flavor website is always evolving; please be aware that we may change this Website Visitor and Usage Agreement from time to time. By continuing to use this site after we post any such changes, you accept this Website Visitor and Usage Agreement, as modified. The ShesGotFlavor.com Website Visitor and Usage Agreement is intended to make our sites safe and fun for everybody. We invite you to bring to our attention any content on our sites you believe to be inaccurate, inappropriate or in violation of these rules. Please write to us at utokialangley@gmail.com. Use common sense when you use our and anybody else’s websites. The content that appears on our sites is for informational purposes only. Despite our efforts to provide useful and accurate information, errors may appear from time to time. The materials/submissions/comments posted by third parties on our sites represent the views of such third parties and are not endorsed by us, nor do we guarantee the accuracy of any posting. Though we hope the advertisers, merchants and users you meet through our sites treat you honorably and fairly, we can’t vouch for the information, goods, or services they offer. Before you act on information you’ve found on or through any of our sites, confirm any facts that are important to your decision. We encourage you to exercise a healthy skepticism and good judgment. 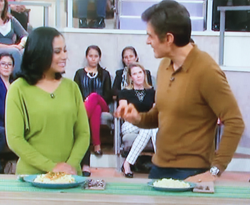 Responsibility for what is posted as a comment or submitted on the She’s Got Flavor website – you alone are responsible for the content of your comment, and the consequences of any such comments. We cannot and do not review every submission/comment a user may make. We neither endorse nor guarantee the accuracy or propriety of any submission. We do, however, reserve the right, but do not assume the obligation, to restrict or prohibit your use of the She’s Got Flavor website if we believe you are violating any of the terms of this Website Visitor and Usage Agreement and to remove, edit, or relocate any submission or comment as we see fit, whether for legal or any other reason. We want users to feel free to share their email addresses in public posting areas. Accordingly, you may not use any other user’s information, personal or otherwise, for any commercial purpose, to send chain letters, junk mail, “spam,” or other bulk communications or for developing lists. Any such use by you will be a violation of this Website Visitor and Usage Agreement. Your use of the sites is limited to personal, non-commercial purposes. Your commercial exploitation of the sites is strictly prohibited, unless we grant prior written permission. 2. This Website Visitor and Usage Agreement and applicable copyright, trademark and other laws govern your use of such content. You are free to display and print for your personal, non-commercial use information you receive through the She’s Got Flavor website. You may not reproduce, distribute, or otherwise use any of the materials without the prior written consent of the Rights holder. Requests for permission to reproduce, distribute or otherwise use materials found on our sites should be made to utokialangley@gmail.com. The burden of determining whether any content on our sites is or is not protected by Rights rests with you. We do not want anyone to be confused about which materials and services are provided by us and which are not. You may not use any mark appearing on our sites without the prior written consent of the owner of the mark. 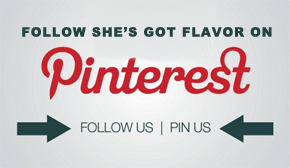 ShesGotFlavor.com and all associated logos are marks owned by Utokia Langley, She’s Got Flavor and Flavor Media, LLC. By submitting material to or through our sites, you grant us and our partners, agents, affiliates and service providers (collectively, “Affiliates”), the non-exclusive right to reproduce, modify and distribute such material as we see fit for any purpose in any form, media, or technology now known or later developed. You agree that we and our Affiliates may identify you as the author of any of your postings by name, email address or screen name as we see appropriate. You also permit any other user to access, display, and print such content for personal use. By submitting material to us, you are representing that such material does not violate or infringe any rights of any third party, including, but not limited to, copyright, trademark and other proprietary rights. If any third-party content is included in any materials that you submit, you must obtain permission from the content owner and attribute such content to the owner. If you are an owner of intellectual property who believes your intellectual property has been improperly posted or distributed via the She’s Got Flavor website, please notify us by sending an email to utokialangley@gmail. Please note that we may access and disclose your personally identifiable information in order to address any infringement claim. You agree to hold Utokia Langley, She’s Got Flavor, ShesGotFlavor.com and Flavor Media, LLC and our affiliates, agents and licensors harmless from any claim that may arise from your use of any of our sites. YOU AGREE THAT USE OF THE SITES IS AT YOUR SOLE RISK. THE SHE’S GOT FLAVOR WEBSITE IS PROVIDED ON AN “AS IS” AND “AS AVAILABLE” BASIS. 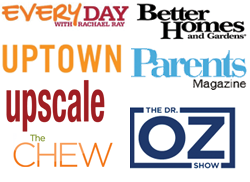 MEREDITH CORPORATION, ITS AFFILIATES, AGENTS AND LICENSORS CANNOT AND DO NOT WARRANT THE ACCURACY, COMPLETENESS, CURRENTNESS, NON-INFRINGEMENT, MERCHANTABILITY, OR FITNESS FOR A PARTICULAR PURPOSE OF THE INFORMATION, MATERIALS AND SERVICES AVAILABLE THROUGH OUR SITES. WE DO NOT GUARANTEE OUR SITES TO BE ERROR-FREE, SECURE, CONTINUOUSLY AVAILABLE OR FREE OF VIRUSES OR OTHER HARMFUL COMPONENTS. THE SHE’S GOT FLAVOR WEBSITE IS PROVIDED WITH THE UNDERSTANDING THAT NEITHER MEREDITH CORPORATION NOR ITS USERS, WHILE SUCH USERS ARE PARTICIPATING IN THE SITES, ARE ENGAGED IN RENDERING LEGAL, MEDICAL, COUNSELING OR OTHER PROFESSIONAL SERVICES OR ADVICE. THE SHE’S GOT FLAVOR WEBSITE IS NO SUBSTITUTE FOR PROFESSIONAL SERVICES OR ADVICE. UTOKIA LANGLEY, SHE’S GOT FLAVOR, SHESGOTFLAVOR.COM AND FLAVOR MEDIA, LLC, ITS AFFILIATES, AGENTS, AND LICENSORS MAKE NO WARRANTY REGARDING ANY GOODS OR SERVICES REFERRED TO, ADVERTISED ON, OR OBTAINED THROUGH OUR SITES, OTHER THAN THOSE EXPRESS WARRANTIES UTOKIA LANGLEY, SHE’S GOT FLAVOR, SHESGOTFLAVOR.COM AND FLAVOR MEDIA, LLC SPECIFICALLY MAKES ON ANY UTOKIA LANGLEY, SHE’S GOT FLAVOR, SHESGOTFLAVOR.COM AND FLAVOR MEDIA, LLC ORDER FORM OR CONTEST FORM. UNDER NO CIRCUMSTANCES WILL UTOKIA LANGLEY, SHE’S GOT FLAVOR, SHESGOTFLAVOR.COM AND FLAVOR MEDIA, LLC OR ITS AFFILIATES, AGENTS OR LICENSORS BE LIABLE TO YOU OR ANYONE ELSE FOR ANY DAMAGES ARISING OUT OF YOUR USE OF ANY OF OUR SITES, INCLUDING, WITHOUT LIMITATION, LIABILITY FOR CONSEQUENTIAL, SPECIAL, INCIDENTAL, INDIRECT, OR SIMILAR DAMAGES, EVEN IF WE ARE ADVISED BEFOREHAND OF THE POSSIBILITY OF SUCH DAMAGES. YOU AGREE THAT THE LIABILITY OF UTOKIA LANGLEY, SHE’S GOT FLAVOR, SHESGOTFLAVOR.COM AND FLAVOR MEDIA, LLC, ITS AFFILIATES, AGENTS AND LICENSORS, IF ANY, ARISING OUT OF ANY KIND OF LEGAL CLAIM IN ANY WAY CONNECTED TO ANY OF OUR SITES WILL NOT EXCEED THE AMOUNT YOU PAID TO US TO USE THE SITES. BECAUSE SOME STATES DO NOT ALLOW THE EXCLUSION OR LIMITATION OF CERTAIN CATEGORIES OF DAMAGES, THE ABOVE LIMITATION MAY NOT APPLY TO YOU. IN SUCH STATES, THE LIABILITY OF MEREDITH CORPORATION, ITS AFFILIATES, AGENTS AND LICENSORS IS LIMITED TO THE FULLEST EXTENT PERMITTED BY SUCH STATE LAW. UTOKIA LANGLEY, SHE’S GOT FLAVOR, SHESGOTFLAVOR.COM AND FLAVOR MEDIA, LLC may discontinue, change, suspend, or restrict access to any of our sites or any portion of our sites at any time without liability to you or any third party. The She’s Got Flavor website is controlled and operated by UTOKIA LANGLEY, SHE’S GOT FLAVOR, SHESGOTFLAVOR.COM AND FLAVOR MEDIA, LLC from the state of Maryland in the United States of America. Those who choose to access our site from other locations do so on their own initiative and are responsible for compliance with applicable local laws. This Website Visitor and Usage Agreement constitutes an agreement made in, and to be construed in accordance with the laws of, the State of Maryland without regard to its conflict of law provisions. By using this site, you consent to the exclusive jurisdiction of the state and federal courts in Maryland, in all disputes arising out of or relating to this agreement or any of our sites. You agree not take any legal action against us that relates to or arises out of the She’s Got Flavor website without first (a) sending us, via email, a detailed written description of the facts and law out of which your claim arises; and (b) negotiating with us, in good faith, for not less 30 days, toward resolution of the dispute. All correspondence concerning such dispute must be sent to dispute at utokialangley@gmail.com, or such other designee as UTOKIA LANGLEY, SHE’S GOT FLAVOR, SHESGOTFLAVOR.COM AND FLAVOR MEDIA, LLC may identify from time to time. In the event that any provision of this Visitor Agreement conflicts with the law under which this Visitor Agreement is to be construed or if any provision is held invalid by a court with jurisdiction over the parties to the Website Visitor and Usage Agreement, such provision will be restated to reflect as nearly as possible the original intentions of the parties in accordance with applicable law, and the remainder of this Website Visitor and Usage Agreement will remain in full force and effect. If either party fails to insist upon or enforce strict performance by the other party of any provision of the Visitor Agreement, or to exercise any right under the Website Visitor and Usage Agreement, such a failure will not be construed as a waiver or relinquishment to any extent of such party’s right to assert or rely upon any such provision or right in that or any other instance. This Website Visitor and Usage Agreement constitutes the entire understanding between the parties as to the subject matter hereof, and supersedes all prior agreements and understandings relating to such subject matter.